Pregnancy can do some crazy things to a woman. 4 pregnancies in 5 years can really do some stuff. Those 5 years were full of many things. Joy, tears, worry, excitement, anticipation, love, laughter, tears, snuggles, cravings, chaos and oh yeah…potatoes. Not just any potatoes my friends…my SPECIAL potatoes. These special potatoes were an evolution of sorts. This recipe came about long before Cajun Mama Cooks and back when I didn’t cook as much as I do now. 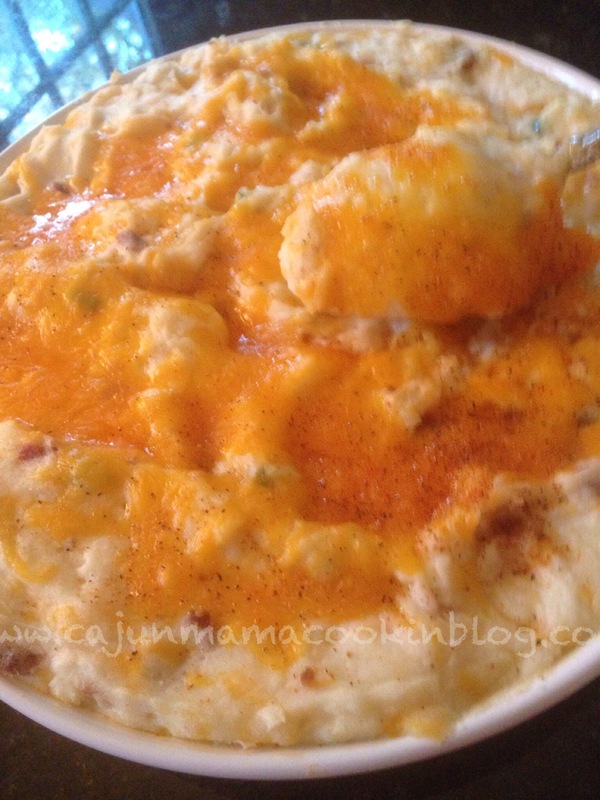 I have always loved twice baked potatoes and in college I used to buy the…gasp…frozen kind. I know. Yikes!! But I liked them. And then we got married and I started cooking more. Money was tight and I figured I would give it a try making them on my own. So I would bake potatoes and scoop them out and make the filling and then put it back in. They were pretty good but then I got pregnant and then pregnant again. And again. My morning sickness was constant and severe and potatoes seemed to make me feel better. I wanted to swim in a big ole bowl of stuffed potatoes. Big Daddy really got into grilling and we loved those potatoes with whatever he grilled, but all that scooping and filling was not my bag. Plus with a bunch of little precious darlings/minions running around, who had time for that? Not me. So one day, I was going to make mashed potatoes so I peeled and cut up a bunch of potatoes and boiled them. But being an impulsive, hungry, pregnant (again) woman…I decided to make what is now affectionately known as my special potatoes. Oh ya’ll…they are so good. The beauty of these potatoes is that they are the perfect side dish. They are laid back enough for barbecue but pretty enough to go on the side of prime rib roast. They go so well with either. Or maybe I say this because I have found a way to cook them all year round, regardless of the season. Oh well…they are really good and 3/4 of my kiddos love them, making them miraculous potatoes in my book. And I have picked up a few short cuts and tweaked this recipe a bit to where they are almost perfect. My old neighbor and dear friend , Stacie, LOVES these potatoes and when I made them I would bring her some leftovers to take for her lunch at work the next day whenever I could. She is still my loyal and wonderful friend after all these years, even though she has seen me through 2 pregnancies and been there with all 4 kids crying at the same time…so maybe these are magical potatoes. She still comes around even though we have moved. They really are that good. So give them a try and at the very least your kids or husband/wife or both might just go into a carb coma after they eat a bowl of these. You will get some quiet time. Magical potatoes indeed. No really, make them. You will be so happy you did. I want to grab a big ole serving spoon and gobble them up!!! Makes about 8-10 servings, depending on size of serving. Preheat your oven to 350 degrees. Grease a 9 x 13 baking dish. Cook your potatoes, whichever kind you decide to use. While they are still hot, dump them into the bowl of your stand mixer or a large mixing bowl. Add sour cream. You can add more or less depending on your taste. Add salt and pepper and tony’s, about 1/2 tsp. of each. You can more later to taste if you wish. Mix on low speed until well combined. Add more salt and pepper, tony’s or sour cream if you want at this point. Add green onions, crumbled bacon and 1 cup of the cheddar cheese and mix until this is all combined. Taste for seasoning and add to it if you wish. Add in some Tony’s at this point too. Again, according to your tastes. Transfer the potatoes to your greased dish. Sprinkle with remaining 1 cup of cheese. Bake for about 25 minutes or until cheese is melted and all bubbly. Serve on the side of whatever meat dish will ultimately pale in comparison to these special delicious wonderful fantastic potatoes. I really love these potatoes if I have not made that clear. Hope ya’ll love them as much as I do.